Janus - ZineWiki - the history and culture of zines, independent media and the small press. 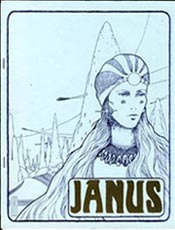 Janus was a science fiction fanzine published in Madison, Wisconsin, U.S.A. in the 1970s. Janus was edited by Janice Bogstad for the first four issues, who was then joined by Jeanne Gomoll as co-editor. Their fanzine was one of the first feminist sf publications. The name of the fanzine was later changed to Aurora; 26 issues were released in total, 18 under the original name of Janus. It was closely associated with the Wisconsin Science Fiction Convention, or WisCon, as the group behind the zine had started the convention, and some issues of Janus also served as program books for WisCon. The editors met at The Madison SF Group, a science fiction group founded by Hank Luttrell (Sirruish, Starling), Lesleigh Luttrell (Starling, Quark), Jan Bogstad, Phil Kaveny, and Tom Murn in 1974. Contributors of writing included Karen Axness, Doug Barbour, Marleen Barr, John Bartelt (Rune), Janet Bellwether, James Blair, Pete Brown, Lee Carson, Suzy McKee Charnas, Cy Chauvin, Cheryl Cline (The Wretch Takes To Writing), Perri Corrick (Corr), Dorothy Dean, Beverly DeWeese, Gene SeWeese, Jonathan Farris, Sherri L. File, Robert Frazier (Star*Line), Laurence Gold, Jeanne Gomoll, Sara Greenwald, Jane Hawkins, Arthur D. Hlavaty, Bill Hoffman, Karen Jones, Philip Kaveny, Hank Luttrell, Lesleigh Luttrell, Loren MacGregor, Carl Marrs, Diane M. Martin, Dave Medaris, Lynne Morse, Thomas Murn, Gayle Netzer, Debbie Notkin, Karen Peterson, Douglas H. Price, Gregory G.H. Rihn, Tom Rogan, Richard S. Russell, Jessica Amanda Salmonson (Windhaven), Jon Singer, Pat Sommers, Angus M.Taylor, Peter Werner, Richard West (Orcrist), Rick White, Clifford R. Wind, Susan Wood (Aspidistra, Amor), and Chelsea Quinn Yarbro. Poetry was contributed by Ruth Berman (SH - sf Fanthology), Janice Bogstad, James A. Cox, Camillia Decarnin, Leslie Dock, Robert Frazier, Terry Garey, Jeanne Gomoll, Terri Gregory, Denys Howard (Women And Men), Philip Kaveny, Neil Kvern, Rebecca Lesses, Pat Mueller (Pirate Jenny), Thomas Murn, Cathy Patterson, Jessica Amanda Salmonson, Mary Jane Trani, Cat Vogel, Stanley Weinbaum, and Jennifer Wilson. Contributors of cover artwork included Sam S. Adkins, John P. Alexander, Brad Foster, Steven Fox, Jeanne Gomoll, Joan Hanke-Woods, Jini Kai, Robert Kellough, Ole Kvern, Georgie Schnobrich, Arlin Teeselink, Eric Wallner, and Jennifer Wilson. Illustrations were contributed by John P. Alexander, Amanda Bankier, John Bartelt, Kurt Baty, Carl Eugene Bennett, Mary Bohdoanowicz, Richard Bruning, Grant Canfield, Kelly Clifton, Perry Corrick, Ctein, Karen Dalkey, Liz Danforth (Impulse), Lela Dowling, Robert Flinchbaugh, Steve Fox, Virginia Galko, Alexis Gilliland, Brian Giza, Jeanne Gomoll, Julie Gomoll, Miriam Greenwald, Lynn Haanen, Joan Hanke-Woods, Teddy Harvia, C. Lee Healy, Steven Vincent Johnson, Lawrence Juliano, Robert Kellough, Ole Kvern, Linda Leach, Mary Louther, Hank Luttrell, Barry Kent MacKay, Tim Marion, Diane Martin, James McLeod (Interplanetary Corn Chips), Dave Medaris, Lynn Morse, Doriane Nieburgs, Chris Pasanen, Joe Pearson, Gene Perkins, Vicky Pierce, Victoria Poyser, Sarah Prince, Gregory G.H. Rihn, Tom Robe, D. Carol Roberts (Impulse), Bill Rotsler, Jessica Amanda Salmonson, Stu Shiffman (Raffles), Don Simmons, Georgie Schnobrich, Dan Steffan (Boonfark), Arlin Teeselink, David Thayer, Theresa Troise-Heidel, David Vereschagin (Neology, The Monthly Monthly), Eric Wallner, Robert Whitaker, Rick White, and Jennifer Wilson. Interviews with Suzy McKee Charnas and Amanda Bankier, editor of The Witch and the Chameleon, were featured. Letters came from Linda Bushyager (Granfalloon), Avedon Carol, Buck Coulson (Yandro), C.J. Cherryh, Don D'Ammassa (Mythologies), Adrienne Fein, William Gibson (Genre Plat), Mike Glicksohn (Energumen), Jeff Hecht, [[Ethel Lindsay] (Scottishe), Gordon Linzner, Vonda N. McIntyre, Charles R. Saunders (Dragonfields), Gene Simmons (Faun), R. Laurraine Tutuhasi (Feline Mewsings), Victoria Vayne (Simulacrum), and Harry Warner, Jr. (Horizons), among others. Janus was nominated for the Hugo Award for Best Fanzine from 1978 through to 1980. Jeanne Gomoll was nominated for the Hugo Award for Best Fan Artist for 1978 and 1980. Janus/Aurora was included in the zine library at the exhibition A Non Utopian Kind of Girl, at The Nursery, in London, UK in 2013. Jeanne Gomoll continued publishing zines in the 1980s with her title Whimsey, and co-published the one shot fanzine Six Shooter, with Linda Krawecke and Pam Wells in 1987. This page was last modified on 11 November 2018, at 14:55.